What is the document retention requirement of a property management company for power of attorney and financial lease documents? For real estate professionals, the general rule of thumb is that you should retain copies of all expired leases for at least seven years. This dovetails with the federal statute of limitations: After seven years, it’s generally too late for any party claiming to be aggrieved to bring a suit against you to enforce that contract. In Florida, however, the statute of limitations on enforcement of provisions of contracts is five years. (The statute of limitations for enforcement of property insurance contracts, however, extends from the date of loss.) For verbal contracts, the statute in Florida is four years. However, the National Federation of Independent Businesses suggests keeping any documents related to the transfer of real estate for at least 20 years. If you file a fraudulent return, there is no limit to the statute of limitations. The IRS can challenge you on the basis of fraud at any time. If you do not file a return, there is no statute of limitations. If you file a claim for a loss due to worthless securities or a bad debt reduction, the statute of limitations is seven years. If you file a claim for credit or refund after you file your return, the statute of limitations is the later of three years, or two years after the tax was paid. All payroll tax documents must be kept on file for at least four years after the tax is due or paid, whichever is later. That said, your property management company should absolutely have a formal, written document retention policy. Fortunately, you’re not on your own. The National Federation of Independent Businesses, in fact, on developing a sound and coherent document retention policy. Note: Some states have passed a version of the Uniform Preservation of Private Records Act, that provides businesses some safe harbor to destroy most records after three years unless there is reason to believe that these records will be relevant to pending litigation, or unless there is a separate statute specifically calling for the retention of these records for a longer period of time. Florida, however, has not passed that law. For other readers, you can see if your state passed that law (select your state from the scroll down menu). Identify a document retention policy manager by name. Ensure that this responsibility is reassigned if the first DRP manager leaves the company. Do not “purge files” or clean out file cabinets willy-nilly. Always have your DRP manager involved in these efforts, and always conduct them IAW your written DRP policy. Go paperless, and back up your data regularly. However, your state may require you to keep paper copies of some documents. Ensure your DRP policy specifies the method of destruction. Never just throw sensitive files in the dumpster. For example, you may have personally identifiable information related to your employees’ health status on file with your health insurance and employee records. Failure to take adequate steps to control and destroy that information could lead to massive fines and even criminal prosecution for violation of the Health Insurance Portability and Accountability Act. Your document retention policy should also address security. For example, employee documents and anything else with personally identifiable information on it should be kept under lock and key, with access strictly controlled and restricted to those who need access, such as those charged with administering employee benefits, for example. Note: Nothing in this article should be construed to be legal advice. Your document retention policy should be closely tailored to your specific state law as well as the nature of your business. As electronic storage gets more affordable, there is less reason to purge files. In the event of litigation or an audit, you may need to keep some files around longer than you think. You may also need to keep some files on hand for public relations reasons, historical interest, or to prepare for the sale of your company. 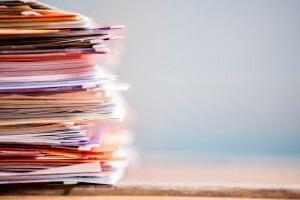 A solid document retention policy can help increase the value of your company to potential purchasers, and even potentially help you manage errors and omissions premiums.